Choosing the best wool mattress topper can provide you with a soft and luxurious feeling bed at a very low cost. 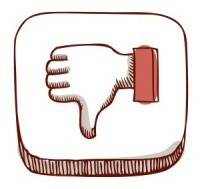 However, finding it can be a daunting task with so many on the market. 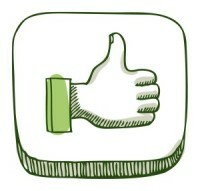 Wouldn’t it be nice if someone did all the tedious research for you? Well, you’re in luck! We’ve sorted through hundreds of wool mattress topper reviews to bring you the top performers on the market in 2019. Before we go into our reviews, let us take a look at some quick comparisons in the table below. Also, we will discuss the advantages and disadvantages of wool toppers compared to others such as latex and memory foam. 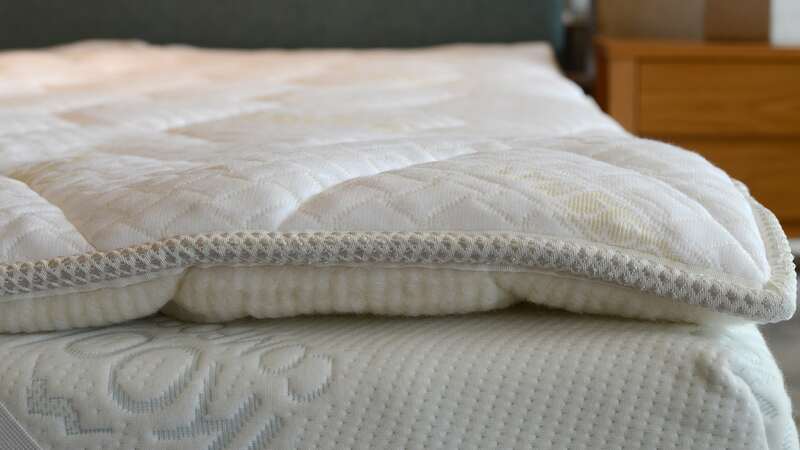 While some may choose a memory foam or latex topper for their bed, there are plenty of benefits to choosing a wool topper that they might not have considered. Below we discuss some of these considerations in depth. Multiple studies have shown that our bodies need to cool down to get a good night’s rest. It allows us to slip into a deeper sleep, among various other health benefits. The synthetic fibers used in most of the common types of mattress toppers often fail to provide the breathability necessary to keep things cool at night, warming up with our body temperature and causing us to wake repeatedly. Wool, on the other hand, is naturally breathable material. This feature allows it to stay cool all summer long but still provide the snug warmth many looks for in the winter. Wool toppers are often made of Alpaca and regional wools, both of which are incredibly soft material. This makes for a wonderfully soft and fluffy topper to help maximize comfort and can be very beneficial if you have a difficult time falling asleep. 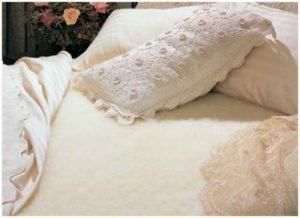 The combination of different wool can provide the comforting relaxation needed to drift off into dreamland. Did you know that wool toppers are naturally hypoallergenic? If latex or feathers and fabrics leave your symptoms lingering around for days, then you may want to consider switching to wool. These toppers are resistant to dust mites, helping to alleviate or even eliminate the cause of your symptoms and lessen asthma triggers. It’s no secret that even if you own one of the best mattresses that money can buy, the longer you own it, the more worn in it becomes. This can cause it to become more compact than it used to be, losing the bounce and cushion it once had. Instead of rushing to replace a costly mattress, wool can give you the cushiony effect your old mattress used to have. Now, no mattress topper is a miracle worker! If your mattress has sinkholes, sags in certain spots, or popping springs, then it might be time to replace it. Often, part of the reason we aren’t getting a good night’s sleep is that our mattresses are too firm. Some might like it that way, but the reality is that your bed should have a little in the form of soft comfort. We’ve already said that wool is nice and cushiony, but that benefit extends to alleviating your body from the stiffness that an extra firm mattress can create. You’ll get a better night rest when you’re more comfortable, and your back will thank you in the morning. Quite often no two people enjoy the same level of firmness/softness. One of you likes to sleep on a cloud while the other prefers rigidly stiff support, but buying an expensive mattress that accommodates each side of the bed might be out of the question. Wool toppers can come in whole covers as well as partial ones. Why not double, or even triple, up on one side the bed to add that firm comfort that one of you enjoys? Wool is also virtually silent when compressed or moved on, allowing for late night trips to the fridge without waking your partner. As someone who enjoys a late-night turkey sandwich, this feature comes in handy for me. Everything has its own set of disadvantages, and even the best wool mattress topper is no exception. That being said, here are some common complaints. It shouldn’t come as a surprise, but memory foam is going to contour to your body and spine a lot better than wool. That means it offers less support as well, but that’s the price you pay for cozy comfort. While wool will remain virtually silent as you sneak out of bed for a midnight snack, it will not help to reduce any motion you make on the bed. That might be a deal breaker for those who have incredibly light sleepers for partners. Being as the product is wool, it comes with a little bit of a barnyard funk right out of its packaging. While that isn’t most people’s idea of a soothing scent, it does fade away after a short while. Lightly scented sprays help move this process along. It’s important to keep your topper clean, and for wool, that means shaking it off along with giving it a good fluff. This is particularly the case for thicker wool toppers. While that might sound like a chore, this will help it maintain its high level of comfort. After sifting through countless reviews, we’ve compiled a list of our 5 favorites based on the criteria above. This topper is made from organic merino wool and features an extra layer of padding made from 100% organic cotton, all of which ensures a hypoallergenic product for those who need it. 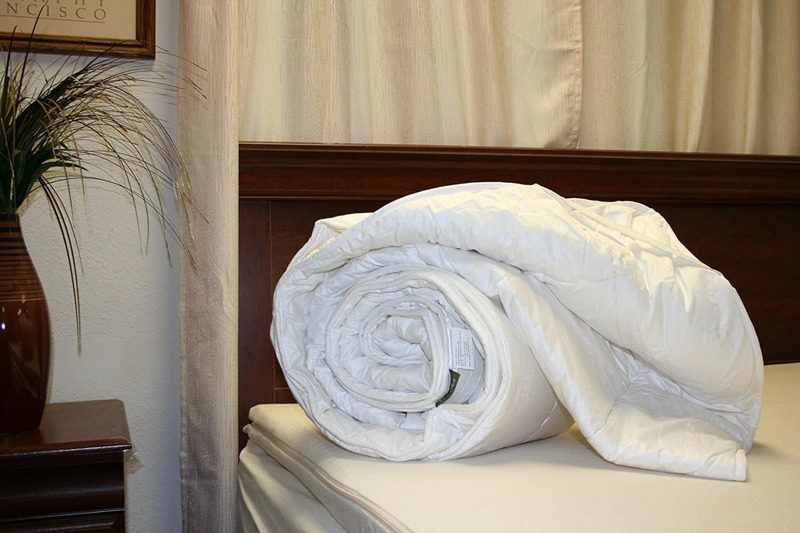 The cotton sateen fabric is also 300 thread count, which is an excellent added comfort. This product is medium on the firmness scale, which might provide the level of cushioning those with arthritis, fibromyalgia, or rheumatism need for pain relief. Being made from natural materials, it is also a chemical free option for anyone with sensitivities. Measuring 1.5 inches thick and weighing in at only 10.2 pounds, this is light topper that can be easily removed for cleaning. The cotton packaging the wool is reusable as well. At 60 x 80 inches, this topper fits most Queen-sized beds. Pure wool on one side, pure cotton on the other, this pad can be reversed for two different experiences at night. While the cushion might remain the same, you can change the feeling on your skin anytime you like. In-between, this product features a down alternative fill made from polyester fiber for added support and comfort. Those looking for an even cooler option in the summertime might enjoy being able to lay on the cotton side instead of the wool. The pad can be machine washed for easy cleaning thanks to its polyester padding, which also helps to alleviate joint pains that come from sleeping on a rough mattress. At 2 inches thick, it offers a firm yet a soft level of comfort. This model can also be ordered to fit various sizes. This product is made from 100 percent American virgin wool, which is excellent for those with asthma or allergies. What makes this product stand out is that it featured 40 ounces of wool per linear yard, adding to the softness and cushioning comfort of the topper. This can help to alleviate the pressure points commonly associated with spring box mattresses. The backing is made from polyester, allowing this topper to be machine washable. Afterward, you can choose to hang it on a clothesline or throw it in the dryer on the lowest setting. When it does come time to replace the topper, it is entirely biodegradable. It should also be noted that the fabric is treated to be fire resistant. While this is a benefit to some, those who are sensitive to chemicals may prefer a different option. This model can be ordered to fit a wide variety of bed sizes. Made from 100% Australian wool, this product comes in an organic cotton covering for easier washing and maintenance. Being made of only those two materials, it is hypoallergenic and eco-friendly. The Australian wool provides a high level of moisture wicking, so much so that they offer a crib sized topper as it can help with accidents. The cotton covering also adds to the overall breathability of this wool topper, helping to regulate temperatures all year round. 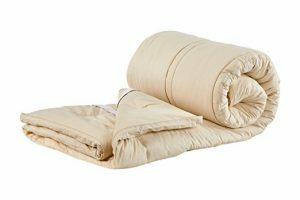 One great feature about this product is that it is chemical free, which might be an excellent option for anyone who is sensitive to chemicals or simply looking for a toxic-free sleeping environment. Those worried about the chore of maintenance can rest easy knowing that this topper is machine washable. This model’s size can be made all the way up to California King. This product features 65 ounces of wool per linear yard, making it incredibly padded and soft. Unlike the others on this list, all of the wool for this model is sourced in the USA. Another easy cleaner, this topper is also machine washable and can be hung out to dry. 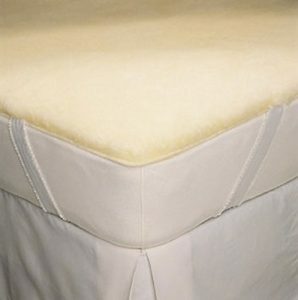 It features straps that hold it in place on top of the mattress, pinning it down so that it does not move when you do. This product is both hypoallergenic and chemical-free, which might make it a good choice for those who are sensitive to the chemicals that are usually found in toppers, or have their asthma triggered by dust mites. While these wool mattress toppers offer their benefits, there can be only one clear winner. We’ve given the 1st place prize to Sleep & Beyond. Hypoallergenic and chemical-free, this all organic topper offers excellent temperature regulation no matter what season it is. While 1.5 inches might not be ideal for some, that thickness does provide ample cushioning alongside the firmness necessary to alleviate common aches from pressure points. With a 300 thread count and merino wool, this is one luxuriously comfy addition to any bed. Plus, the cotton covering is easily removed for simple cleaning and maintenance. Overall we feel this is the best wool mattress topper out there. 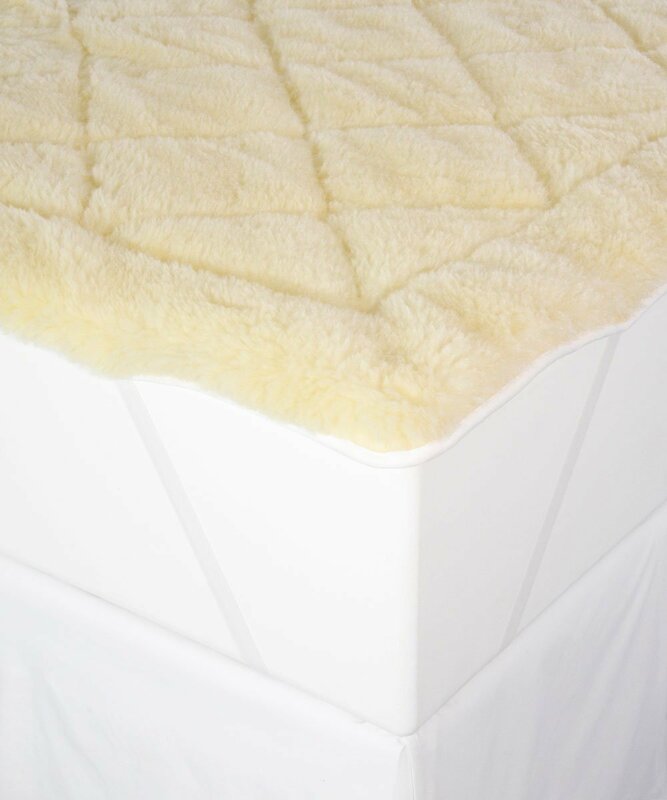 After reading the above, if you’re still unsure about wool as your next choice of bedding surface, take a look at our selection of best mattress toppers, which include some of the top-rated latex, synthetic and memory foam variants.